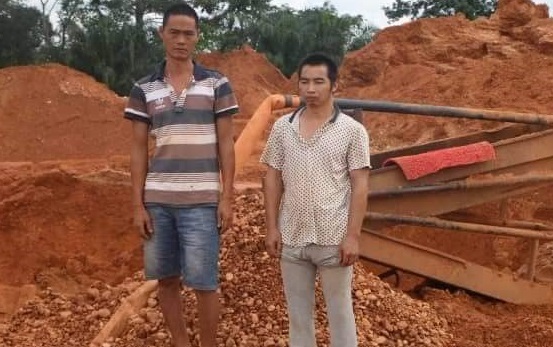 THE ANTI-GALAMSEY taskforce, Forward Operation Base (FOB) of Operation Vanguard, has arrested two Chinese nationals in the Ashanti Region. The suspects were arrested at a mining site at Taabusere in the Amansie West District of the Ashanti Region during a special patrol on August 11, 2018. According to the taskforce, the foreigners were handed over to the Datano Police Station for further investigations that would lead to prosecution. Two excavators, 33 changfan machines, five water pumping machines, one DAF excavator engine, 16 floating platforms, four washing platforms, and four cylinders were immobilized, while two control boards, four monitors, four batteries, one water pumping machine and one excavator turbo charger were seized. The taskforce explained that the mining equipment were seized at several mining communities across Ashanti, Central and Western Regions during patrols carried out on August 9 and 10 this year. The communities are Amponyase and Atta-Kwamekrom in the Adansi North and South District, Kwabeng, Damang and Mbaa Baase in the Amenfi West and Huni Valley Districts, as well as Apaabena in the Upper Denkyira West District. Government banned all forms of small-scale mining activities in the country last year with the view to sanitize the sector following pollution of river and water bodies in addition to land degradation and deforestation. President Akufo-Addo said his government’s fight against illegal mining phenomenon popularly called galamsey operation would continue unabated, and that the government would be in support of every action that prevents forest degradation and deforestation.